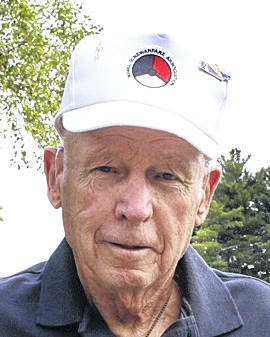 GALION — George Harmon is well known in the Galion area for a lot of things, including his connection with Candlewood Lake in Morrow County. But one fact many didn’t know about Harmon was made public again Friday night at Heise Park Stadium. The stadium used now by Galion High School’s football teams, wrestling teams, track teams and other athletes is not an original. Previously, a field house sat on the same site. But it burned to the ground Nov. 25, 1957. And that’s where Harmon entered the picture. He accepted chairmanship of the Citizens Committee-Building Fund, set up by the Galion Boosters Club, which was charged with raising $50,000 to build a new stadium. That new stadium still stands today, although it has seen plenty of upgrades and modifications throughout the years. Harmon, who will turn 92 next month, was unaware that he was being recognized for his efforts at halftime of Galion’s game vs. Marion Harding. Likewise, many had no idea that he spearheaded an effort that raised the funding for the new facility. That money came from Galion High School alumni, service clubs, area businesses, local clubs, individuals and more. The new stadium was officially presented to the school officials 60 years ago during a high school football game vs. Ashland. On that night Harmon said: “It is with a great deal of satisfaction that I perform the function that I have been asked to perform tonight … that of officially presenting the stadium field house to school officials. In doing so, I am representing the many wonderful people who supported our campaign by contributing both their time and money to make this process possible. “He went on to say: “Three people, whether they know it or not, have served as my inspiration: my wife Lee, my wonderful neighbor Howard Nussbaum, and the best high school football coach in the state of Ohio, Bill Durtschi. “Everyone who had anything at all to do with the building this monument of community pride, please accept my sincere thanks and appreciation. They are and have been for six decades. For 60 years thousands of area athletes, football fans, track teams, Pickle Run Festival participants and visitors, fireworks viewers, families of graduates and others have put the stadium to great use. 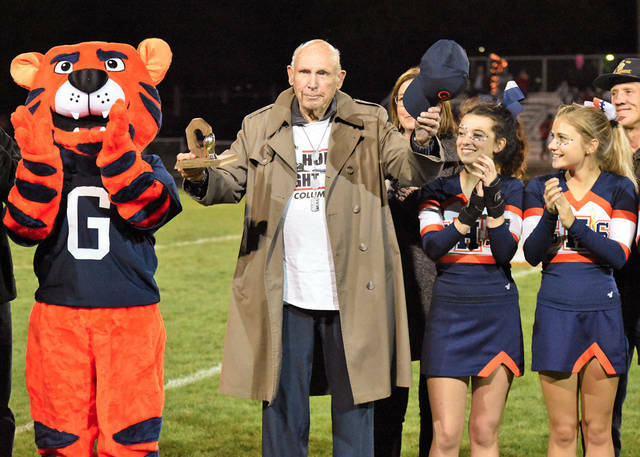 George Harmon was recognized at halftime of the Marion Harding at Galion football game for his role in helping raise funds to rebuild the GHS football facility in when it burned down some 61 years ago. Photo by Don Tudor. 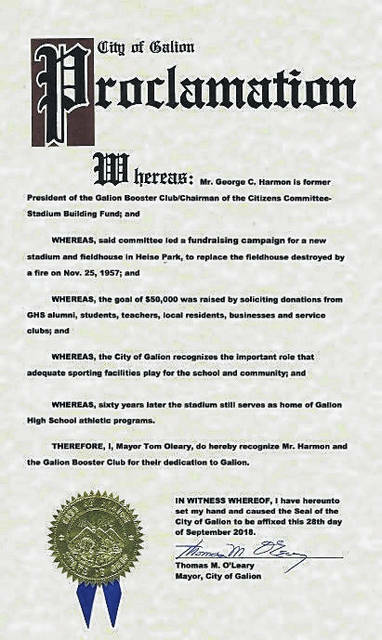 https://www.galioninquirer.com/wp-content/uploads/sites/38/2018/09/web1_A1-fea-092818j-Harding-at-GHS_0296.jpgGeorge Harmon was recognized at halftime of the Marion Harding at Galion football game for his role in helping raise funds to rebuild the GHS football facility in when it burned down some 61 years ago. Photo by Don Tudor.